It’s 2016, and times are changing. So is the way we do business and the way companies present themselves to their customers. Companies are required to listen to their customers demands and expectations in order to strive. Millennials are increasingly rewarding companies whose products and services benefit them, and society in a positive way. According to an article in the Huffington Post, “66% of global consumers say they’re willing to pay more for sustainable brands–up 55% from 2014.” Furthermore, 73% of global Millennials are willing to pay extra for sustainable offerings–up from 50% in 2014. This statistics indicate the increased trend of customers seeking to buy from companies that adopt corporate social responsibility, particularly millennials that demand companies to “put their money where their mouth is”. In today’s markets, millennials have a strong influence making up an estimated $1 trilion of U.S. current consumer spending. 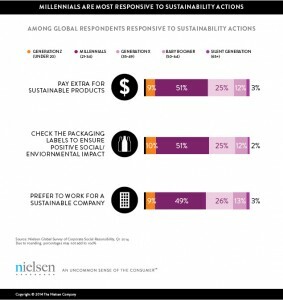 Millennials seek to buy from companies that make a positive contribution to society, and are willing to make personal sacrifices for issues that are important to them, whether that means paying a higher price for a certain product/service or taking a pay cut for working for a company that pursue social responsibility. 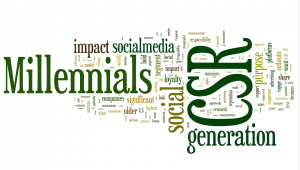 It is clear that millennials put a premium on a company’s corporate social responsibility (CSR) efforts and companies must do so as millennials represent the consumer market of the future. In this electronic age, consumers are far more savvy and can search for a company’s record and labor practices any time they want. Then, they’ll take to social media to talk about it, using those platforms as a powerful tool to spread the word, positive or otherwise. When looking at millennials, traditional advertising is no longer effective. Reflecting CSR efforts to millennials means honesty, millennials have grown up in a digital era with tools like social media and they want themselves heard. They seek a two-way discussion with companies to know how they’re making a positive contribution to the world. They seek honesty and transparency. As discussed during class talks, corporate social responsibility is an increasingly popular trend amongst businesses nowadays. Businesses want to make sure all their stakeholders are satisfied, in order to strive in their markets. With millennials making up a massive portion of the US consumer market, it is important companies do not neglect their expectations or else they could suffer. Social media and the very act of sharing are in millennials’ DNA. From Facebook and Twitter to Instagram, they’re sharing their lives online and expect companies to be equally forthcoming and transparent. Therefore, CSR efforts need to be clear and transparent by a company, failure to do so may lead to major ramifications. Many companies are ado pting CSR to meet millennials’ needs. 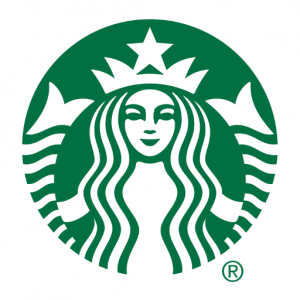 Starbucks is a prime example of a socially conscious company, being ranked as Fortune Magazine’s fifth most socially responsible company in 2012. The company looks for better ways to develop sustainable production of its coffee. It has set in place ethical practices, ensuring environmental leadership, economic accountability, and product quality. Starbucks also supports Ethos Wat er, which provides clean water to more than a billion people. 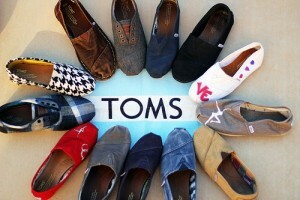 Another great example is Toms Shoes, a company created around the idea of giving back. For every pair of shoes sold, another pair is donated to a child in need. More than 10 million pairs of shoes have been donated, and that charitable effort has now extended to vision care for kids. Such companies have realized the importance of customer relations and the need to be socially responsible, and have made a positive effort towards CSR that has highlighted their success.